Delaware County Prosecutor Melissa Schiffel poses for a photograph Monday in the Delaware County Prosecutor’s Office. Schiffel was sworn in Friday afternoon to serve out the rest of Carol O’Brien’s unexpired term, which runs through November 2020. 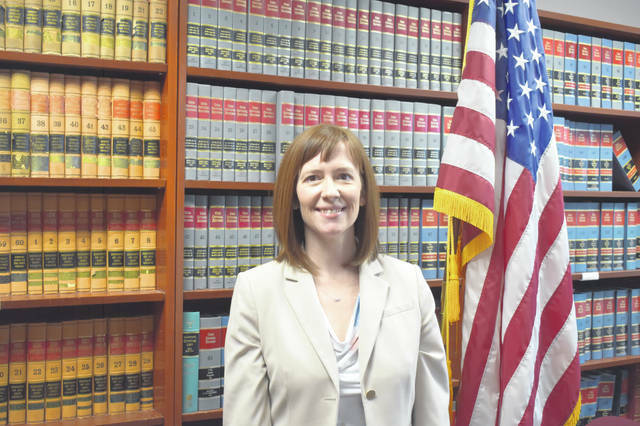 Newly sworn-in Delaware County Prosecutor Melissa Schiffel said Monday that the office has been a career goal of hers, and she’s looking forward to engaging with the community. Schiffel was sworn in Friday afternoon, replacing Acting Delaware County Prosecutor Christopher D. Betts, who was appointed to fill the vacancy when former prosecutor Carol O’Brien resigned from the position to take a job with the Ohio Attorney General’s Office. Schiffel said she grew up in Dublin and graduated from Dublin Coffman High School before moving on to attend Ohio University and Ohio Northern University, College of Law. Schiffel began practicing law at the Wood County Prosecutor’s Office before taking a position as a special prosecutor at the Ohio Attorney General’s Office. As a special prosecutor, Schiffel would step in to prosecute a case if there was a local conflict of interest in the case. Schiffel said the position required her to travel as far as Williams County in the northwest corner of the state. Schiffel left the attorney general’s office in 2016 when she took the position of Delaware city prosecutor. Schiffel said the biggest change moving from prosecuting only felonies to prosecuting misdemeanors was the caseload. Schiffel said her background in the special prosecutor’s office gave her the confidence to handle the caseload. When O’Brien departed the prosecutor’s office in February, Schiffel said she was excited to apply for the position because it had been a goal for her. Schiffel said she believes O’Brien did “a wonderful job,” and she hopes to continue to engage and educate the community. She added that she’d like to create a Youth Olympics program in Delaware County. Schiffel said the event is a “huge undertaking” and will take partnerships in the community. Schiffel will serve out the rest of O’Brien’s unexpired term, through November 2020, and have to campaign for the seat after that. She lives in Galena with her husband, Nate, and their daughter, Perri.